Am I excellent at yoga? No. Am I excellent at conferring? Not yet. But every time I confer with a child I feel the magic. Conferring is a practice that transforms the complexities of teaching and learning into a joyful, magical experience. Lately, I’ve been doing a lot of reflecting about conferring and wondering what makes it so magical. 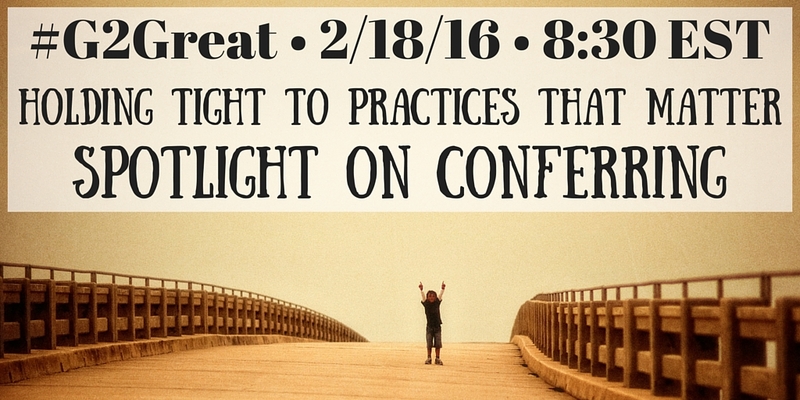 As I reflect on this question, I find three common areas that make conferring a practice we need to hold tight. Conferring is about building relationships, trust, and responsive differentiated instruction. Conferring creates opportunities to build strong, caring relationships. A simple yet powerful first step in conferring is to slow down, sit alongside a child, look into their eyes with a warm smile and ask, “How’s it going with your reading today?” In five short minutes we can learn so much about each of our students. This sends a message that we really care about them. When we make ourselves present in the moment by listening, observing and admiring, we come to a deeper appreciation of how unique each child truly is. That is magical. Conferring provides opportunities for students to trust our coaching and intentions. As they trust us, they begin to trust their own thinking and develop skills and strategies to become independent, joyful, proficient readers. Conferring also provides us with an opportunity to begin to trust our own abilities to notice, compliment, wonder and provide just right feedback to move the reader forward. It isn’t about trusting a program or a script but trusting ourselves, the reader and the process. That is magical. Conferring is student-centered, differentiated instruction at its best. Conferring begins with a student centered mindset. We meet that student, at that moment, exactly where they are. We notice, listen, celebrate, and guide them with next steps. Each student gets what they need. Dylan’s tweet reminds us that conferring, zooming in and focusing can be like taking beautiful snapshots of our readers. That is magical. Hold tight to conferring. Make it a daily priority. Fran Mcveigh reminds us that conferring is where the magic happens. Some of us may not be excellent at conferring…yet. But when we slow down, build relationships, trust, and provide responsive differentiated instruction, this is where the magic happens. When we are conferring we are connecting. Whether we are conferring with readers, writers, colleagues, or friends, we are all side by side, learning, growing, talking, listening, and planning. Our long term goal as educators is to teach thinking and independence. When I think about independence the words of Peter Johnston echo in my mind, “Teach them to be independent, you are not going to college with them!” That day as I listened to Peter Johnston talk about the urgency in teaching independence, I knew that the gradual release model of instruction led students to independence. 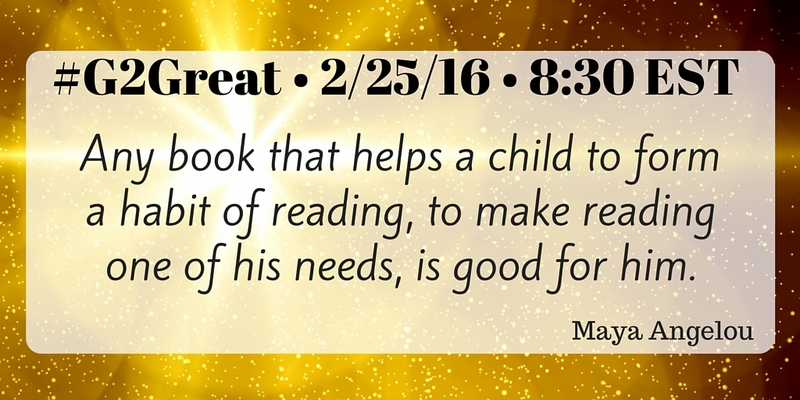 On February 11, 2016 #G2Great Chat series, “Holding Tight to Practices That Matter” put a spotlight on shared reading. As I reflect on our chat, I still hold that idea very tight. Shared reading in itself is about a teacher and students reading a text together. It is inherently a shared experience, certainly not independent. The independence comes later and as a result of all this great work that happens in a shared reading experience. During the chat, Joanne Duncan (@joanneduncanjo) tweeted “Collectively our voices grow stronger.” That is where the magic happens. We give our students opportunities to grow stronger through shared experiences and once they have grown strong enough they are independent. That is the goal. Don Holdaway, the founder of shared reading showed us the Natural Learning Model. In this a learner observes a demonstration, then participates in guided practice, later moving to unsupervised role playing and practice, and ultimately performance sharing and celebration of accomplishments. All of these aspects are built into a shared reading experience where collectively our students are given the opportunity to grow stronger together. I am reminded then that just as our students become stronger due to the collaborative nature of shared learning, as educators we too become stronger when we engage in shared or collaborative experiences. This is the beauty of a shared learning experience, whether we are referring to adult learners or our youngest early readers. Making time for these experiences should be a priority in our schools for all learners. 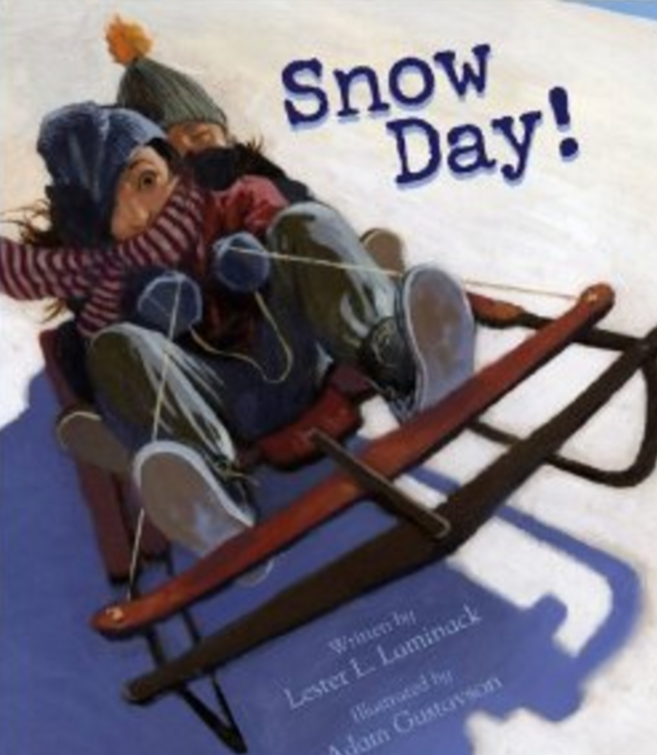 This week as we gathered our minds around shared reading we created a list of books that you can access here. 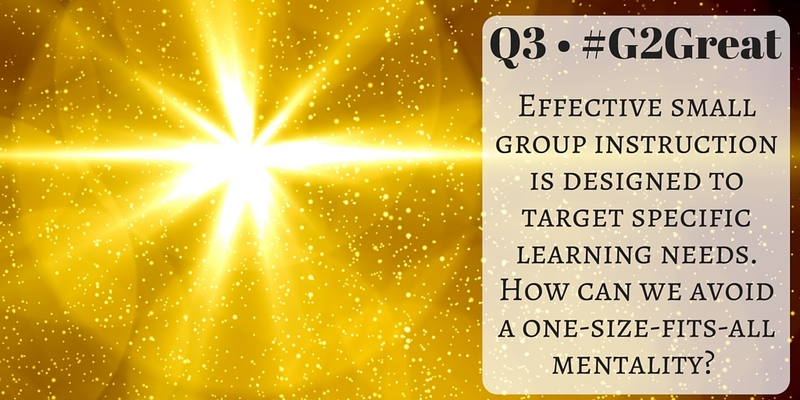 If you are looking for a great shared experience join in on the #G2Great chat, you can see how the shared experience enhances our learning as adults. Teachers are overwhelmed, overstressed, and overburdened. The Testing Machine is out of control. Class sizes have grown astronomically. Funds and materials are in short supply. I’ve noticed that the more skilled and gifted the teacher, the higher their stress, tension, frustration, and disappointment. Because they KNOW it should be different and could be BETTER. I was immediately drawn to the potential for Beginner’s Mind to impact the quality of our practices at a time when mandates, scripts, packages and programs seem to be the norm. 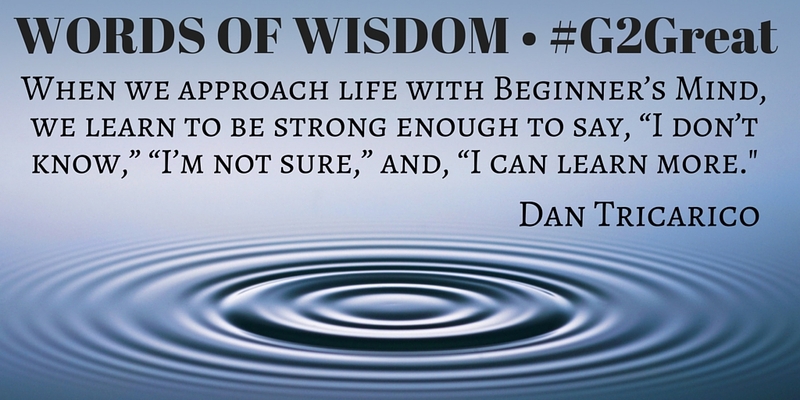 Dan’s words remind us that not holding the answers in our hands can launch professional explorations of not knowing far removed from the guarantees, quick fixes, and silver bullets waved in front of us like a badge of honor. A Beginner’s Mind embraces the idea that there is great wisdom in taking the time to envision opportunities that are not yet in view. Dan’s Beginner’s Mind exemplifies the extraordinary teachers in this country who still insist on keeping students at the center of their efforts. These teachers refuse to turn a blind eye to the thoughtful decision-making that can elevate teaching, knowing that professional excellence occurs only when a knowledgeable teacher is at the helm even when forging a path that is not always clear. The truth is, a Beginner’s Mind resides within every teacher willing to invest time and effort in the unknown. Good teaching is messy because students are rarely predictable. 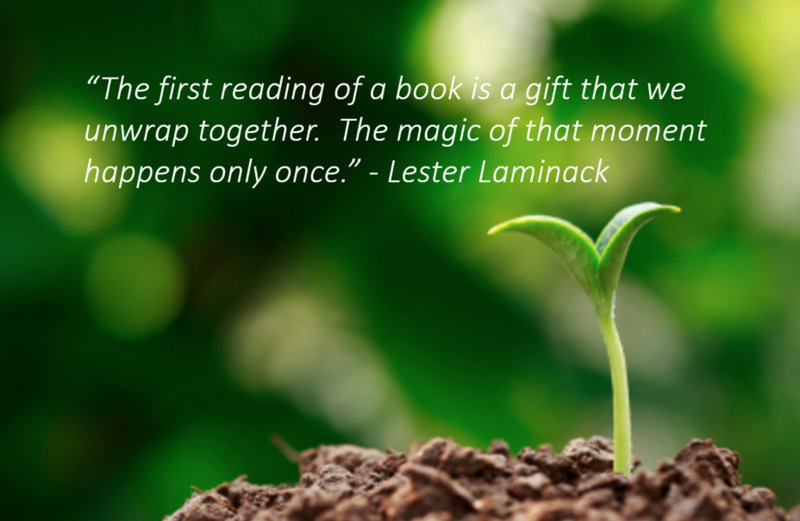 But if we can awaken our Beginner’s Mind and all of the uncertainty that involves, we can recapture the joy of surprise that comes when children, not publishers, are the heart & soul of our work. Now more than ever, we need to acknowledge that students always have been and always will be our first responsibility. And in the end, they are the reason excellent teachers across the country delight in entering the zone of ‘not knowing’ where endless possibilities abound. Oh yes Dan, dance indeed!